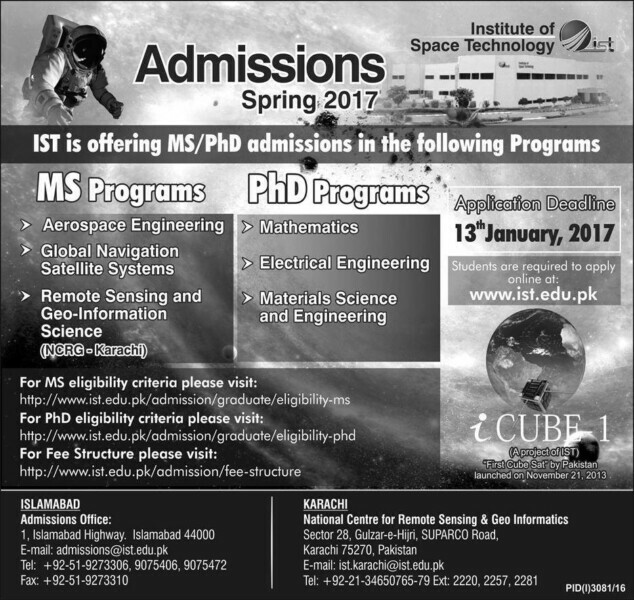 One of Pakistan’s leading university focused on astronomy, aerospace engineering and astronautics- Institute of space technology (IST) is now offering admissions in Ms/Phd in the following programs. The candidate interested should secure atleast 50% marks in Graduate Assessment Test-General (GAT-General) taken by NTS. In addition to the above requirement, The candidate is required to pass an interview. The applicant should have completed 18 years education from any HEC recognized University/Institute. The candidate should secure minimum 60% marks in Graduate-Assessment Test-General (GTA-General) taken by NTS. Please note that a registration fee of RS 20,000 and security deposit of RS 10,000 (refundable) is also required to be paid at the time of admission. Also, we have only included the fee of Per credit hour, other charges like sport fee, library fee, Laboratory fee are also applicable. If you want to apply in any of the above programs, visit the official website of Institute of Space Technology fill out the admission form with relevant details, and that’s it. You are done. You have successfully applied in IST. Please note that the last date of submission of admission for is 13th January, 2017. Make sure you have applied before this date to avoid any inconvenience. Share this article with your friends and let them know about the admissions in Institute of Space Technology, some of them might be interested in applying.